Holbeach manager Seb Hayes during a 3-0 win over Leicester Nirvana. Photo: Tim Wilson. Peterborough Sports’ amazing run of home wins in the United Counties League came to a disappointing end at PSL today (December 17). The city side had won their previous 31 home games in the competition - 11 of them in the Premier Division this season - but they couldn’t break down a dogged Rothwell Corinthians side this afternoon. Deeping Rangers celebrate their sixth goal against ON Chenecks. Photo: Tim Wilson. The match finished goalless as Sports’ lead at the top was cut to six points by second-placed Eynesbury, 8-0 winners over Oadby. Sports still have a game in hand. 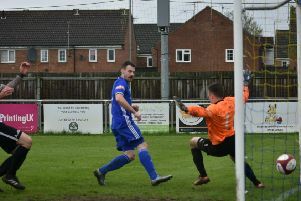 Deeping Rangers are a further three points adrift in third as they stretched their unbeaten top-flight run stretch to 17 games with a 6-0 dismissal of ON Chenecks at Outgang Road. Star striker Scott Coupland went past 30 goals for the season with a hat-trick while skipper David Burton-Jones, Dan Flack and Scott Mooney were also on target. Holbeach United are fifth after cruising to a 3-0 win over Leicester Nirvana in new manager Seb Hayes’ first home game in charge. Josh Ford, Callum Madigan and Chris Ward scored the goals. Josh Ford celebrates the opening Holbeach goal against Leicester Nirvana. Photo: Tim Wilson. Wisbech could have helped their local rivals by beating fourth-placed Desborough, but they spurned a host of scoring chances in a game that finished goalless. Yaxley were six goals worse off this Saturday, but still despatched Harrowby United 4-1. The Cuckoos had smacked 10 past the same opposition last weekend, but were briefly pegged back at 1-1 before easing clear today. Cameron Stump scored a debut goal for Yaxley, while Stuart Wall, Liam Hook and Jack Saunders also netted. Saunders was returning from injury. Peterborough Nothern Star led at Cogenhoe through a Jezz Goldson-Williams goal, but the hosts found an equaliser after the break. Action fron Deeping Rangers 6, ON Chenecks 0. Photo: Tim Wilson. Blackstones, who completed the signing of Jack Smith from Holbeach before the game, were held 3-3 by Long Buckby in Division One. Steve Mastin, Josh Russell and Callum Parker scored for Stones. Spalding are within a point of top spot in Division One South of the Evo Stik Northern Premier Division after a fine 2-0 win at Gresley. Conor Higginson and Matthew Varley claimed the goals in the last quarter of the match for the third-placed Tulips. There was more disappointment for struggling Stamford at this level as they conceded a 74th-minute own goal equaliser against fourth-placed Sheffield at the Zeeco Stadium. Curtis Hanley was the unlucky Daniels’ player. Grant Ryan had opened the scoring with a terrific goal on 57 minutes. Action from Holbeach 3, Leicester Nirvana 0. holbeach are in yellow. Photo: Tim Wilson. Sean White was the March Town United match-winner in Division One of the Thurlow Nunn League against Team Bury at the GER. Action from Deeping Rangers (maroon) win over Leicester Nirvana in the United Counties Premier Division. Photo: Tim Wilson. Stamford 1 (Ryan), Sheffield FC 1. Harrowby United 1, Yaxley 4 (Hook, Stump, Wall, Saunders). Blackstones 3 (Parker, Mastin, Russell), Long Buckby AFC 3. Whitton United 2, Wisbech St Mary 1.